Harmony Farm is located 20 minutes west of Quesnel, in the heart of the Cariboo region of British Columbia, Canada. 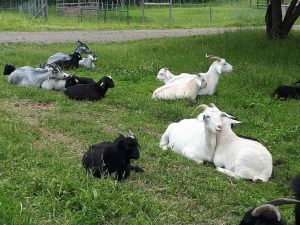 We raise Cashmere goats and Icelandic sheep as naturally as we respectfully can. We sell Cashmere Goats – kids from histogram and competition proven bucks and does. We offer only those weanlings that we would keep as see stock, ourselves. We also have a limited number of fine, purebred Icelandic lambs available for breeding purposes. Choose either registered or grade.